Eligibility verification is thus made easy and fast, increasing reliability and integrity. In the DepEd-ARMM, this online verification of eligible's name, license number and birth date has been instituted since the assumption to office of Atty Jamar Kulayan as Regional Secretary of DepEd-ARMM. According to Sec Kulayan, "this makes it easy for us to verify whether an applicant is eligible or not. Because of this mechanism we have put to rest allegation of fake eligibility." The documents of applicants whose name, license number and birth date are not in the online registry are not processed. Regular teachers are advised to check their names in the online registry. Atty. Teresita R. Manzala, Chairperson, Board of Professional Teachers, P. Paredes St. corner Nicanor Reyes St., Sampaloc, Manila, at telephone numbers (02) 314-0026 and (020 735-4476. Sec Kulayan reminds those with PRC transaction to be extra careful and vigilant with "fixers". These unscrupulous individuals claim to be able to shorten the process or with "inside contacts". There are already incidents of ARMM teachers who have been put in hot seat all the while thinking they are eligible; when they went to PRC to renew their license it was too late to realize they were duped by these fixers. There are also cases on appeal with CSC on fake eligibility. 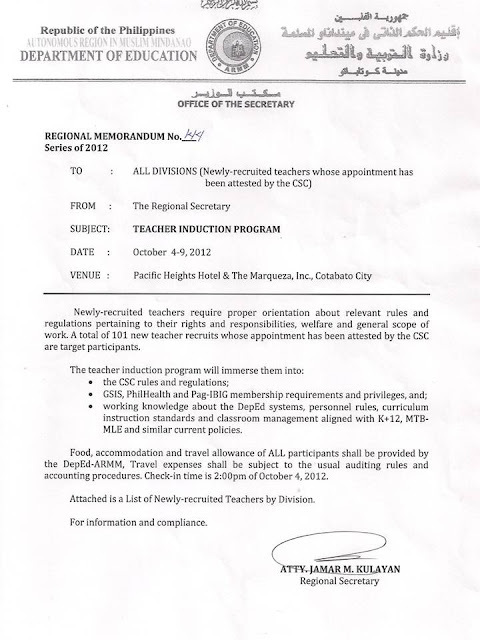 The DepEd-ARMM Regional Office will orient newly-hired teachers on October 4 to 9, 2012 in Cotabato City. About one hundred newly-hired teachers will be oriented. Coinciding with the World Teacher's Day celebration on October 5, 2012, these new teachers will also be inducted by no less than the ARMM Regional Governor Mujiv Hataman. As part of the orientation, these new teachers will be immersed on the DepEd system, new policy direction on K+12 and MTB-MLE, CSC rules and membership with GSIS, PhilHealth, Pag-IBIG and PPSTA. They will also have privileged meal time with key DepEd-ARMM officials. DepEd-ARMM will pay for the whole activity. Transportation expenses (most economical) mode will be reimbursed at the venue. The participants will also be informed directly by the Action Center for Education (ACE) to test the latter's DETxt system facility. 9. STO. TOMAS, KINA ERIKA R.
14. MAGALLANES, SHIELA MAY C.
1. SUAREZ, ROCKY JOHN S.
3. NAIK, SITTIE RAIHANAH T.
2. ANTALLAN, MARIA LUISA B. 8. SALDICAYA, CHERYL LYN B. 5. MAMOKAN, SITTIE ULFAT D.
7. MACAUROG, BAI FATIMA S.
8. GLANG, AISHA MICA S.
9. DECAL, MELODY JOY P.
1. MAUJON, ABDEL NAZER M.
2. PAALAN, RHIA MAY C.
Many school and district heads have visited the Regional Office arguing for the recruitment of provisional applicants based on the so-called Localization Law. Republic Act 8190 or the so-called "Localization Law" grants priority to residents of the barangay, municipality or city where the school is located. The argument is that on the basis of this law, a resident non-eligible have a stake over eligible one. "In the appointment or assignment of teachers to public elementary or secondary schools, priority shall be given to bona fide residents of the barangay, municipality, city or province where the school is located: Provided, That the teacher possesses all the minimum qualifications for the position as required by law." So while the law recognizes residency, the same should also "possess the minimum qualifications for the position as required by law". It is also an established Civil Service ruling that minimum qualifications include meeting the required eligibility. The Kabang Kalikasan ng Pilipinas,Inc. (WWF-Philippines) represented by its Vice President Joel Palma sealed the Memorandum of Understanding (MOU) with the Department of Education Division of Tawi-Tawi represented by the schools Division Superintendent, Dr. Kiram K. Irilis,PhD today September 26,2012 at the Dan Mar Resort, Bongao, Tawi-Tawi. The MOU on Population, Health and Environment (PHE) is a WWF project that seeks to address problems on poverty by strengthening the capabilities, skills and resource management of local folks focusing on Reproductive Health as a means to protect the environment. The link between population, health and environment is very obvious; a huge population has an impact on the resources in the community that affects the environment. Trees may be cut for daily use or for building the homes, marine resources may be depleted and become scarce as many will be in need, congestion may result and thus health will become an issue. The DepEd Tawi-Tawi as a partner agency will assist the WWF in the trainings, IEC /advocacy on Reproductive Health Issues and concerns among youth and adult/couples in the three identified island Municipalities of Turtle Islands, Sitangkai and Languyan. Together with DepEd are Department of Health (DOH) IPHO, Department of Social Works and Development (DSWD), Provincial Planning and Development Council (PPDC), Tawi-Tawi Marine Research and Development Foundation, Inc (TMRDFI) and MSU-TCTO. It is hoped that in the future WWF will come up with a school-based approach on PHE as there are a number of youth in school. Christine T. Sangkula, RN, MPA serves as the focal person for DepEd and has been actively involved in the project. Meanwhile another MOU between KKPFI (WWF –Philippines), DENR and LGU Bongao on the Management of Bud Bongao and Mt. Kabugan was also signed today for their protection and making them as Tourist Parks. The Tanggol Kalikasan and MSU-TCTO likewise had their MOU on the Establishment of the Institute of Environmental Governance for Tawi-Tawi and ARMM. Key personalities in attendance include: Gov. Sadikul A. Sahali, VG Ruby M. Sahali, Joel Palma VP-WWF- PH, Atty. 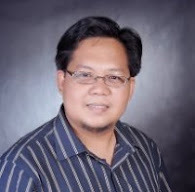 Lorenzo R. Reyes, Chancellor MSU-TCTO, Atty. Ma. Paz G. Luna, President Tanggol Kalikasan, Mayor Jasper Que (Bongao) Dr. Sukarno U. Asri (DOH), Dr. Kiram K. Irilis (DepEd), Dr. Jumelita B. Romero, President- TMRDFI, Nestor Delasas, (PPDO),Ms. Nursalina Alcala (DSWD representing Ms. Hania H. Aliakbar), etc. (tinsangkula/DepEd Tawi-Tawi). 1. UNREMITTED CONTRIBUTIONS UNDER THE FIRST MOA IN 2004. 2. In FY 2006, Congress appropriated 250M for the payment but only 127M was utilize by the DBM solely for the payment of principal. The remaining 123M returned to the National Treasury. 2. UNREMITTED LOAN DEDUCTIONS for 17 months, e.g. October, November and December of 2001; November 2003; March, September, October, November and December 2004; and February, March, April, May, June, July, August and September 2005. These figures do not include the loan deductions from DepEd Basilan personnel for April 2003 to September 2003 that were not remitted to GSIS. These figures are subject to reconciliation. 7. ACTIONS TAKEN BY PRESENT ADMINISTRATIONS. - The present administration already entered into three (3) separates MOA with GSIS. 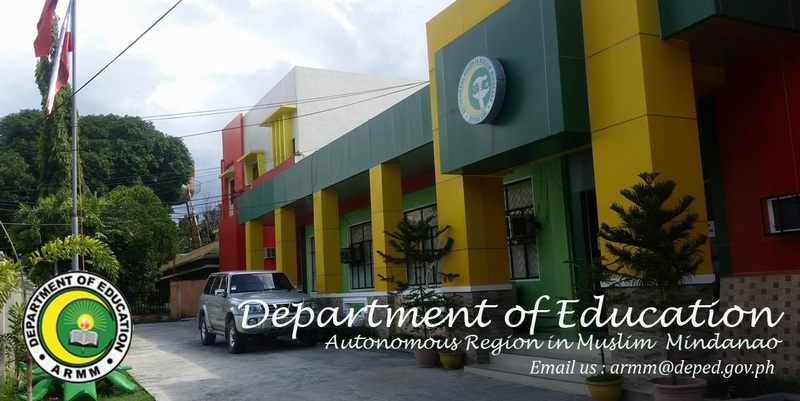 The First MOA was for the Service Record Updatingso that billings from GSIS will be accurate and excess payments made by DepEd-ARMM in the previous years may be applied as payment to the total amount due from DepEd-ARMM. The Second MOA was for the payment of the Basilan Account under Item No. 3. The Third MOA was the settlement of theMarawi Account under Item No. 3. 9. UNPAID PPSTA CONTRIBUTION AND AMORTIZATIONS. - The Philippine Public School Teachers Association (PPSTA) is also collecting 31M from DepEd-ARMM. Out of the grand total of 2.1B, the amount of 1.2B refers to penalty and interest alone. These figures are already beyond our capacity to pay. Aside from these amounts, we are still trying to solve the unclaimed backwages, salary differentials and adjustments of our teachers. Thus, we respectfully pray that immediate actions be undertaken by Congress, GSIS and DBM to help us solve these problems. More than the teachers who are still in active service but whose morale and dedication to service are affected, our retired teachers are in the losing end. They received less than the amount actually due them for retirement because their creditable service was reduced corresponding to the actual number of their unremitted contributions and are receiving lesser monthly retirement benefits. Unless we immediately act on these problems, they may not be able to fully enjoy the fruit of their long and dedicated government service.